Portugal is a romantic, cultural and beautiful country waiting to be explored. The countries landscape varies so significantly from north to south that you are able to have an entirely different holiday experience depending on the region you visit. dessert terrains and stunning beach resorts in the south. Scatter around the country are historical, picture perfect villages, medieval castles and beautiful countryside. It is for sure that you will find a fabulous array of restaurants to sample the famous Portuguese cuisine including, bacalhau, a wonderful salted cod dish the Portuguese people have obsessed with since the 16th century, and “cozido a portuguesa” a rich thick stew. With Portugal having 1793 km of coastline you will find delights from the sea on almost every restaurant menu. along the silver coast. A city riddled with history and some beautiful architecture such as the Ponte 25 de Abril resembling the Golden gate bridge. To the south of Portugal is the world famous Algarve region served by the airport of Faro. 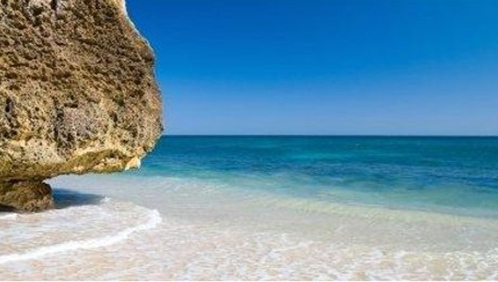 When you think of the Algarve you think of warm sunshine, beautiful sandy beaches and relaxing holidays. Portugal enjoys hot and dry summers and mild sunny winters making it a year round holiday destination.